When you get your braces off or finish your last Invisalign tray, it’s a momentous occasion. It means you made it through the teeth straightening process successfully and you have a beautiful new smile to show for it. However, in order to ensure those results last forever, there is one more step in your orthodontic treatment and that’s wearing a retainer. I know, I know, that’s probably not what you wanted to hear but as my Abbotsford, Langley and Surrey Invisalign and braces patients can attest, when you see how awesome your smile looks after your treatment, your main priority will be keeping it exactly how it is. So, wearing an orthodontic retainer actually won’t feel like a huge deal. What is an Orthodontic Retainer and How Does it Work? Retainers are orthodontic appliances that hold the teeth in their new positions, allowing you to retain your results, hence the name. 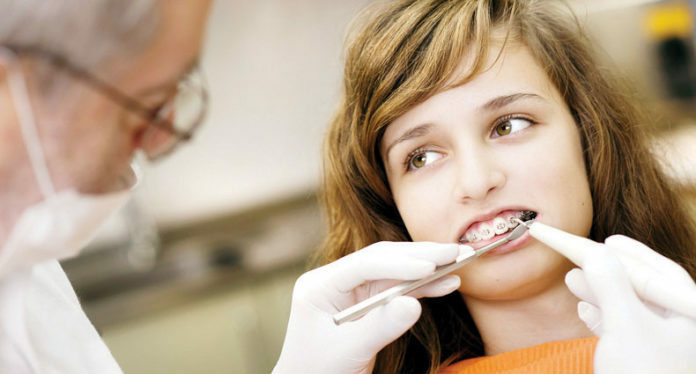 Orthodontic treatment consists of two phases: the active phase and the retention phase. During the active phase, your braces or Invisalign aligners exert constant, gentle pressure that moves the teeth. This force causes changes at the cellular level in your gum tissue, periodontal ligaments and alveolar bone, which are all responsible for securing the teeth in your mouth. During this process, known as bone remodeling, the bone tissue breaks down and is removed from the body (bone resorption). The periodontal ligaments also stretch due to the force application from braces or Invisalign. This is why teeth can sometimes feel a bit loose during orthodontic treatment. These changes allow the teeth to move freely into place. When new tissue and bone forms (bone ossification) in the spaces where the teeth used to be, they get secured in their new places. All of this happens during the active phase of your treatment. When I take your braces off or you stop wearing your aligners, suddenly, that constant force is gone. Of course, there will be a natural settling process after treatment and the teeth will make almost imperceptible movements. As an orthodontist, I plan for this and some settling can even be beneficial and further improve the bite. However, relapse is a different story. The teeth do have a tendency to want to go back to their old places and this can happen rather quickly, particularly in younger patients with fast metabolisms whose bones are still developing. Additionally, when the bone ossification process I just talked about happens and those ligaments go back to their normal size, the teeth need to be in the correct place so they’re firmly cemented in their new positions. As if this wasn’t complicated enough, there are also gravitational and age-related changes that occur in the body. These changes aren’t limited to our appearance and also affect the bone and tissue in the mouth. Now, throw tooth wear from chewing and pressure from your tongue into the mix and you can see why it is a challenge to maintain the results from orthodontic treatment. So, how do I meet this challenge? I address movement, ward off relapse and keep settling to a minimum with the retention phase, which involves, you guessed it, wearing a retainer after braces or Invisalign. As for how a retainer works, well it holds the teeth in their new position while the tissues and bone reorganize to give you stable results. In the short-term, a dental retainer will essentially lock your smile into place. Over the long-term, with continued use, you can prevent movement from age-related changes too. When you finish the active phase of treatment, Dr. Sharma, Dr. Lin or Dr. Koo will fit you for a custom retainer and give you directions for how long to wear a retainer after braces or Invisalign. Every patient is different and it will depend on the complexity of your case. For a removable retainer, you may need to wear it nightly and for several hours during the day for the first few months. Then, you’ll transition to using just at night for a year or two before eventually only needing to wear it a few nights a week. It’s really important that you follow your orthodontist’s directions for using your retainer (or retainers) since getting lax about wearing it or not using it at all can result in needing orthodontic treatment again down the road. Your teeth can feel a little sensitive when you first start wearing a retainer. The feeling is similar to when you started braces or Invisalign. This will go away in a few days. If you skip wearing your retainer for a little while, you’ll feel the same discomfort and have to get acclimated to it again. I’ve been asked, should you wear your retainer if it doesn’t fit? While some pressure is normal after a few days of not using it, if it’s been a while and you have difficulty wearing it or it just randomly stops fitting (a sign it’s been damaged), book an appointment with me and I’ll get to the bottom of the issue and, if necessary, create a new retainer for you. • Fixed Retainer – Fixed retainers, or permanent retainers, consist of a customized wire that is bonded to the back of your teeth on the tongue-side with a special material. They can last for decades with proper care and no one will be able to tell you’re wearing them. The benefit is you don’t have to keep track of it. I’ll often use a fixed retainer if the teeth were rotated, if you had lower crowding or if you had significant gaps between the upper front teeth. It can be used in addition to a permanent retainer or on its own, depending on your case. • Removable Retainer – Removable types of retainers include a traditional retainer with a thin wire that wraps around the teeth, called a Hawley retainer, or a clear, plastic retainer, referred to as an Essix retainer. A Hawley retainer consists of a small piece of plastic that fits against the roof of your mouth or the bottom of your mouth, depending on if it’s an upper retainer or a lower retainer, with a wire attached to it. The wire goes around the front of the teeth. The wire on a Hawley retainer is visible, however there aren’t brackets or other components so it’s not as noticeable as braces. One of the benefits of a traditional wire retainer is that I can make slight adjustments with it, which I can’t do with the other types of retainers. If, for example, you forget to wear your retainer for a bit and a tooth is slightly out of place, I may be able to shift it back by making an adjustment to your retainer. Clear retainers, which are technically thermoformed retainers or vacuum formed retainers, are synonymous with the term Essix retainer. However, Essix is actually brand of a material that’s used to make them, so it’s kind of like calling a plastic baggie a Ziploc baggie or a vacuum cleaner a Hoover. Clear retainers are made from a plastic material and are shaped like a horseshoe to fit your dental arch. They go over your teeth just like an Invisalign aligner. Invisalign even has its own brand of retainer called a Vivera retainer. The retainer is extremely durable and resists cracking. How long does an Invisalign retainer last? It can last for many years if you take care of it, however, it will need to be replaced when you notice signs of wear. • Retainers collect plaque and are in constant contact with spit and bacteria, so they can get pretty gross if you don’t clean them. As for how to clean retainers, for removable retainers, whether it’s a clear retainer or a Hawley retainer, brush it daily with a soft-bristled toothbrush. Be sure to get all of its surfaces. Toothpaste can scratch your retainer, especially if it’s an abrasive one. Instead, use mild dish soap like Dawn. After brushing your retainer, rinse it off really well. Every once in a while, it will need a deeper clean. I’m often asked can you use denture cleaner on retainers? The answer is, sometimes, but ask me first to make sure it’s okay for your specific type. Some retainers respond well to cleaners like Efferdent for the deeper cleanings. You can also use a special retainer cleaning solution. Invisalign makes them specifically for Invisalign retainers. Don’t feel obligated to spend the money though. A DIY solution of equal parts distilled white vinegar and water is effective too. Mix the solution and let your retainer sit for about 15 minutes.